Sony announced the U.S. distribution rights to Blood+ back in January of 2006. In March of 2007, it started airing on Adult Swim. Apparently, over the holidays, someone at Sony Pictures TV Entertainment suddenly remembered this fact, and they’ve finally gotten around to putting it on DVD, by god. Yesterday, Sony announced Blood+ will be available for home use on March 4 in two versions?the regular Vol. 1, with 5 episodes, but also as a six-disc Season 1 box set containing the first 25 episodes, plus a t-shirt and manga sampler. This is the first time an anime licensor has released a (near-)complete box set at the same time as the first volume; this is interesting…okay, it’s interesting to me as an anime industry nerd, and no one else. My apologies. 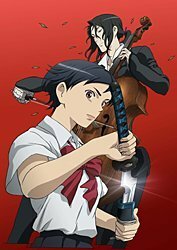 FYI, Blood+, like 45% of all anime, is about a school girl who fights vampires with a sword. I’ll move on now.